Earlier this week Nigel Farage, the leader of UKIP until he sort of resigned, but didn’t quite, appeared at a Trump rally in Mississippi to give his support to Trump. Sort of. He never actually told the assembled crowd that he would vote for Trump. Rather, he said that if he were an American, he wouldn’t vote for Hillary ‘if you paid me’. He then told the assembled Trumpists that they could defy the polls and win, just like Britain defied the polls and won with Brexit. Amy Goodwin, one of the main anchors with Democracy Now!, discussed this with the veteran British thesp, Emma Thompson. Thompson had been in the arctic, and so hadn’t been around when Farage made his pronouncement. Asked for her reaction, Thompson declares that it was frightening, because Farage and Trump were both ‘nationalists- White nationalists’. She was shocked that Trump didn’t accept the reality of global warming, and declared that she was amazed that anyone who had anything between their ears didn’t believe in it, when 98 per cent of the world’s climate scientists did. This included that IPCC, which usually offered only mild criticism. Even they realised we were in serious trouble. She stated that one good reason for voting for Hillary was because she did believe in climate change. It’s quite a messy little interview. When challenged by Goodwin over what she meant by ‘White nationalist’, Thompson doesn’t answer the question and carries on talking. She’s still talking when the titles start rolling and Goodwin has to cut her off. I think she’s right about Trump being a White nationalist. He does have very strong racial views against Mexicans and Muslim immigration, even if he tries to camouflage it with claims that Blacks and Hispanics really love him. A similar racism did fuel the Brexit campaign and is evident in much of Bilious Barrage’s party, UKIP, despite its repeated claim that it won’t tolerate members, who have been members of the Fascist Right. The reference to the arctic I think refers to a film Thompson has been making on the effects of climate change on the environment in that region. About this, I doubt, however, that Shrillary will be much better than Trump. She accepts the reality of climate change, but my guess is that she’s too much of a corporate shill beholden to the big energy companies and Wall Street ever to want to do much to curb their depredations on the environment. Anyone seriously interested in Green issues and tackling climate change would probably be better voting for Jill Stein and the Greens. And finally, there’s Farage’s presumption in telling Americans how to vote. Talking about this with Mum the other day, she reckoned it was ‘a bit of a cheek’. It is. No nation likes being told which way to vote by foreigners. I remember the time over a decade ago when the Guardian – or was it the Observer – was so horrified by the prospect of Bush winning the election that they organised a mass letter writing campaign to voters in one of the counties in Ohio, on the grounds that this district had just the right number of voters to swing the vote. This had the opposite effect. Good patriotic Americans were duly royally annoyed at being told what to do by the Limeys again, 200 years after throwing us out. The result was a landslide for Bush, and much hilarity on Have I Got News For You when they covered the story. Grey-haired old socialist politician with a cult-like following refuses to accept that for the good of his party he must step aside to end party infighting that will gift government to their ultra-right opponents. It’s a spectacularly bad piece of political analysis, but it shows very clearly the very strong bias towards the Democrat and New Labour political establishment running through the Eye. Bernie Sanders, who campaigned against Hillary Clinton, was denied the Democratic nomination through dirty tricks. The Democratic establishment and party machine under Debbie Wasserman Schultz rigged the caucuses in Shrillary’s favour through the use of superdelegates, along with other machinations. The result has been a major political scandal. Sanders’ supporters turned up to protest at the Democratic National Convention the other week complaining that they were silenced. Sanders stepped aside, and urged his supporters to vote for Hillary, despite the fact that she stands for everything that he and they oppose: corporate power and corruption, the indiscriminate use of military force, the overthrow of democratically elected left-wing regimes and their replacement by brutal fascist dictatorships, further welfare cuts and poverty in the American heartland. It’s been pointed out by The Young Turks that Sanders was massively more popular than Shrillary, and stood a far better chance of beating Fuehrer Trumpf. But Bernie was too left and radical for the Democratic establishment to stomach. So they knifed him in the back, just like the Labour rebels are doing to Corbyn. The Young Turks and related radical internet news programmes have also commented on the growing support for Jill Stein, the Green Party’s presidential candidate, and the bitter resentment against a corrupt political system that denies severely ordinary Americans a voice. In the clip below, for example, The Turks’ reporter Jordan Cheriton talks to a young political scientist professor, Rex Troumbley, at the Green Party convention. Troumbley teaches at Rice University, and was a supporter of Bernie Sanders. He then switched to the Greens when the Democrats did the dirty on the people’s candidate. Troumbley explains very clearly why young millennials are dissatisfied with the two party system, a system that is ‘set up to disenfranchise’. He makes the point that they are far more receptive to radical views about their nation’s history – those that take into account the fact that the Founding Fathers hated and feared democracy, the genocide and dispossession of the Amerindians, slavery, Jim Crow and the rest, rather than the upper-class White male perspective pushed by establishment outlets like Fox News and the Republicans. And these kids want radical change. In the piece from The Young Turks below, Jordan Cheriton talks to Bernie Sanders supporters, who have formed the Demexit campaign, modelled on Britain’s Brexit. Just as Britain, in their opinion, left the Union when it felt it was no longer part of it, so the Bernie Sanders’ supporters are leaving the Democrats to move to Jill Stein and the Greens because of the way they are not represented by Shrillary and the establishment Democrats. And I could go on. Clinton and Trump between them are the most unpopular presidential candidates in American history, ever. In a recent poll, only 27 per cent of American voters were happy with Trump’s finger on the nuclear button. And Clinton was only marginally higher at 38 per cent. And the dissatisfaction is growing. The Liberal hosts of one American political programme on MSNBC went into absolute meltdown the other day when they found out that John Negroponte had endorsed Hillary Clinton. Negroponte’s a truly heinous individual. He was one of Reagan’s people responsible for arming the death squads in Latin America, amongst his other crimes against humanity. Jimmy Dore, another reporter from the TYT, made a point of criticising them for only just waking up to how horrible HRC was, after they had criticised her opponents, like the Turks, as ‘misogynists’ and ‘Bernie Bros’, and derided Susan Sarandon as ‘insane’. I’m putting this up because, although it’s American, it parallels what’s happening over here with the attempts of the Labour establishment to stick the knife into Jeremy Corbyn. The Blairites are corporate warmongers exactly like Clinton. Tony Blair modelled New Labour on Clinton’s New Democrats, which took over the pro-corporate, anti-worker, anti-welfare policies of the Republicans. 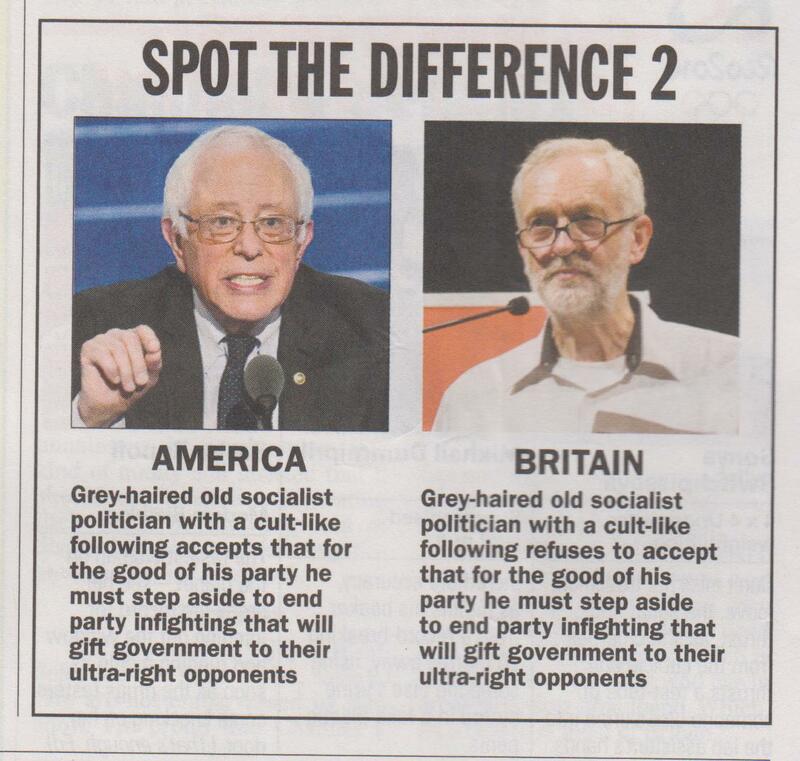 Private Eye and the Blairites sincerely wish that the Labour left, who have found a voice with Jeremy Corbyn, will shut up and abandon him, leaving them to continue the same policies of courting the middle classes and the corporate establishment, including the right-wing media, while privatising everything and destroying the welfare state. They’re aghast that the working class they have marginalised, ignored and sneered at are supporting Corbyn and abandoning neoliberalism. But, looking at what’s going on in America shows that removing Corbyn won’t change anything. He’s started a grassroots movement. If they get rid of him, people will leave the Labour party en masse, and a major third party will emerge from his supporters. It could be either the Greens, or parties like the TUSC, the Socialist Party, or Left Unity. Or it could be a completely new third party. Either way, the demand for a genuine, socialist alternative will remain, and it will challenge the Labour establishment. Regardless of the lies and spin the Blairites and Private Eye want us to believe.